Have you tried Pirate Ship for shipping? Arrrrgh, there is a new shipping integration afoot. I admit it: I was skeptical at first. Pirate Ship seems TGTBT. After all, Etsy already gets commercial rates. How does an online seller tap into the lowest shipping rates without spending a monthly fee? I think I have found it: Pirate Ship. The interface is clear and easy. The rates are competitive. I save especially when shipping small, heavy items. Ability to combine some different selling venues into one shipping source, such as Etsy, eBay and Shopify. Pirate Ship imports shipping details from Etsy, eBay and Shopify. After purchase, it marks orders as shipped on Etsy and other venues. Setting up my Dymo 4XL was a breeze. Included is up to $100 insurance. If you need additional insurance they use U-Pic which is 75c up to $50. Pirate Ship has free chat support where you can ask questions. You can pay for labels as you print them or you can pay in advance. Is it the very cheapest for every package? Stay tuned for how it goes in 2019. PirateShip uses cubic shipping rates when applicable. Cubic shipping is shipping by space and not weight. (Have you ever been disappointed that your heavy item was just a tad wrongly shaped to fit into a regional box?) Cubic rates are purely by size, maximum of 20 lbs. Skip this section altogether if you just plan on dropping your product details into Pirate Ship... This is the math for those who wonder how it works. Measure the outer length, width, and height of your package in inches (18" max in any dimension). If any of the measurements are over the nearest quarter inch, round down to the nearest 1/4" (for example, 5.6" inches becomes 5.5" inches). Multiply the Length x Width x Height and divide the result by 1728. The resulting number is the size of the package in cubic feet. 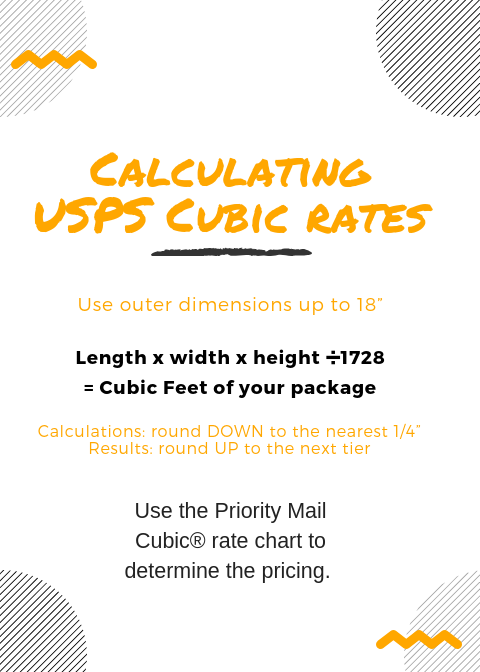 Use the Priority Mail Cubic® rate chart to determine the pricing. (Be sure to round UP fractional results to the next tier... for example a package that is 0.24 cubic feet is in the 0.3 tier). What are the zones, anyway? This great question was brought up by a reader of this blog post. The USPS zones are based on where you ship from. They are different for almost everyone (if you have a different 3-digit zip, the first three digits of your zip code). To find out yours, go to the USPS at this link. Type in the first three digits of your zip code; a chart will appear with your zones. I keep a copy in my shipping room for reference. What about International First Class Mail? My husband was still skeptical. "How will this go come tax time?" He had a point. I found the "reports" tab. It will be one more step, an additional calculations for taxes of course. And they have these pretty data charts. You must provide some basic information to Pirate Ship. In order to access your account and pull your orders, you must grant them some access to your account (much like Foto Fuze if you have used that integration). There are other things to set up like your return address, package templates and content of shipping emails. Read here how to set up additional "ship from" addresses. It seems too good to be true. How do they make money? “How can Pirate Ship possibly stay in business when it is 100% free while offering the deepest USPS® discounts available? Online sellers need several tools in their shipping "box." Adding this to my favorite folder. Thank You for taking the time to explain this "Pirate Ship" I've been hearing about. Arrrrgh! Thanks Joanne for doing all the research on giving us Sellers another option for shipping...I have downloaded Pirate Shipping and will use it on our next order! I very recently ran across Pirate Ship & had the same question about how they stay in business. Thank you for confirming that it's legit! I'm going to try it, especially with USPS rate increases & Etsy wanting a portion of our shipping costs, which I think is outrageous. I've never understood the zone thing, though? Is there an easy-to-understand explanation? How do I find out my zone? Type in the first three digits of your zip code and a chart will appear with your zones. Thanks for your comment, and I hope this helps! Ysabel, your question was so good, I am adding this information to the blog post! P.S. Jerry your question was so good I added the information to the blog post. Thanks for bringing it up!